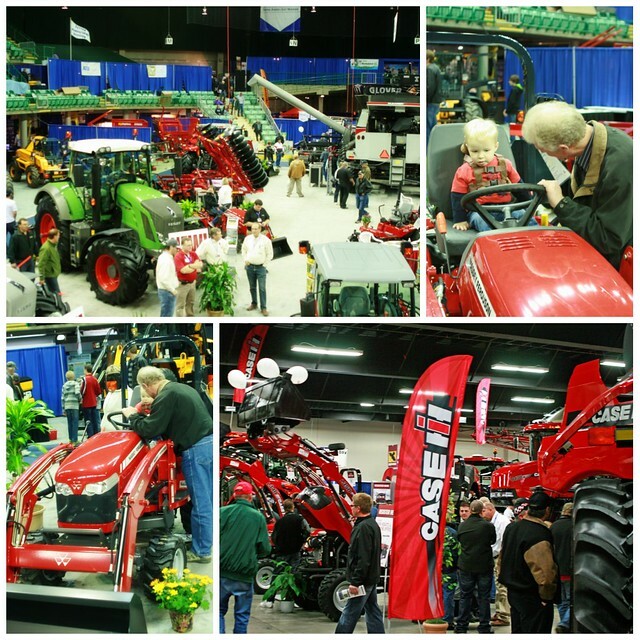 We had such a great time at AgriTrade! Braden had a blast! He was SO cute! 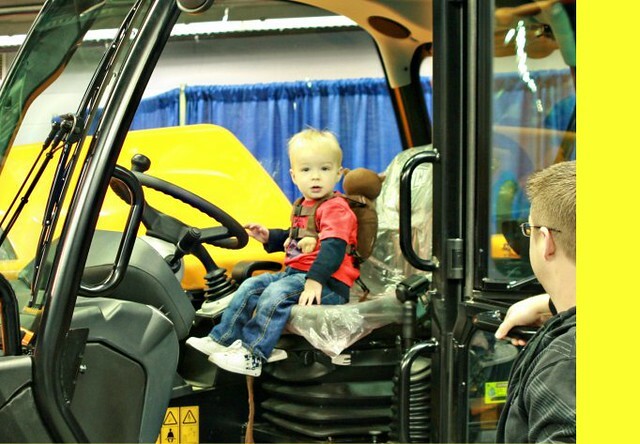 He was just so overwhelmed and overstimulated…”tractor!”, “loader!”, “skid steer!” EVERYWHERE!!! And he could sit in the machinery and “drive” it and everything! He got a lot of attention…he was pretty darn cute! 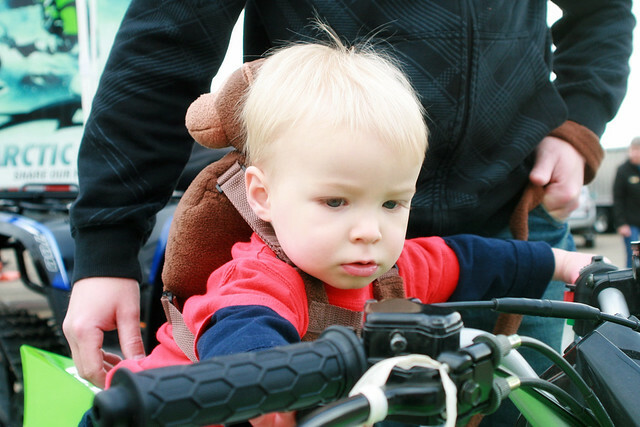 Yup…Braden is a harness/leash baby…and we’re proud of it! It gives him a bit of freedom, we don’t have to hunch over and struggle to hold his hand, or don’t have to carry almost 30 pounds of toddler! 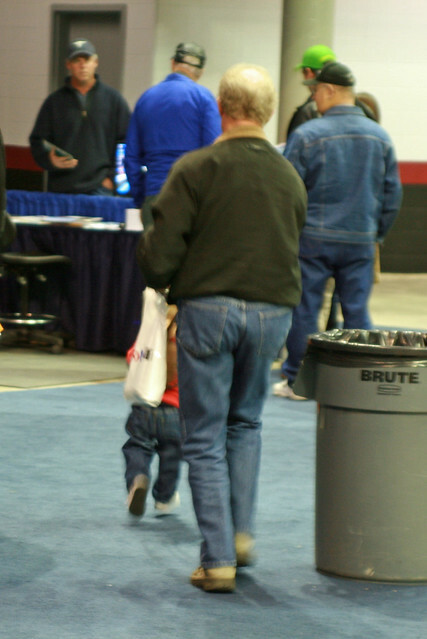 I know this pic is blurry…but it just kinda gives a glimpse at how fast the little guy is! Wanna know why he’s in such deep concentration? Because he’s such a keener and he’s looking for the keys! He knows where they are and what they’re for. Scary! 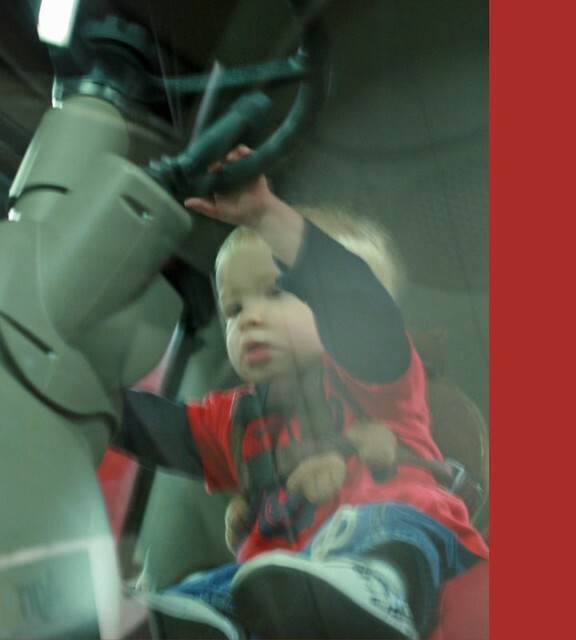 Another blurry picture, but this is what it looks like from the ground when a toddler “drives” a combine! So he had over an hour nap on the trip to drop him off at Mom’s school about 1 hour away and he has had so much fun at his Grandma & Grandpa’s house, they wanted to keep him an extra night! So there we were, last night on our 3rd toddler-free night! We haven’t had this much time to ourselves since Vegas in February, so it was super, super nice to have some “me” time and some “us” time! Thanks, Mom & Dad! I didn’t take any pictures, but I did tons of shopping and hit: Michaels [Christmas crafts & party supplies for Braden’s birthday], Old Navy [50% off new winter jacket pour moi], Bed, Bath, & Beyond [you know, this and that! ], Bath & Body Works [Christmas candles & soaps], Home Sense [my FAVORITE! Christmas decor & gifts], Smart Set [new sweaters for me], Toys R Us [Christmas present for Braden], Costco [twin’s birthday presents, this’n’that]…and I think that’s it! I had such a great time, I happily drank 2 drinks, shared a big appy plate, ate a 7 oz steak & lobster tail, and had a chocolate sundae for dessert with my husband and in-laws on Thursday night courtesy of a chem company that the farm purchases from! I’m really not a greedy, take-all kind of person, but when someone says to me “order whatever you want”….I’m gonna do just that! 😉 Can’t wait until next year!! What a fun time! 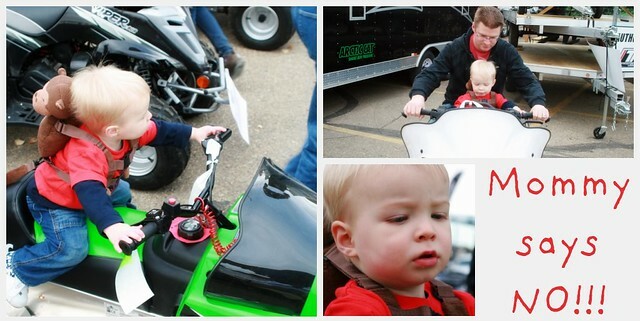 A farm show sounds like a blast for Braden! And 3 toddler-less nights… jealous! We have a leash for Tristan too but his daddy doesn't agree with leashing so I told him it's just a backpack lol.it looks like Braden had a lot of fun too and I'm glad you guys got some free time. Hmmm I didn't see anything on that shopping list for the best babysitters EVER! LOLWe had lots of fun with him. He's a doll! So well behaved and happy! Hope the trip to your place goes well for Papa!! I've got snacks and books and toys packed, so hopefully it will be fine! I pretty sure B had the best time ever! That's so cute! And I'm glad you and Jay got some toddler-free, alone time as well! Wish I had known about it I would have totally come! Mom & Dad never tell me anything! I think it's pathetic that I've never been to a farm show. Looks like Braden had a blast! 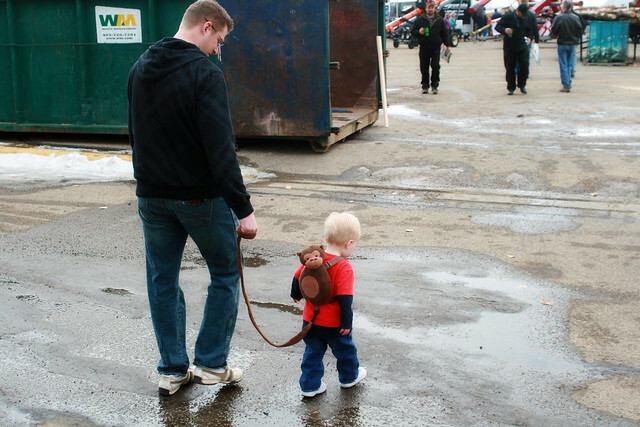 I love the leash:). Aww He looks amazed at all the tractors and I love his monkey bag that are actually riegns, where did you get that ? ?